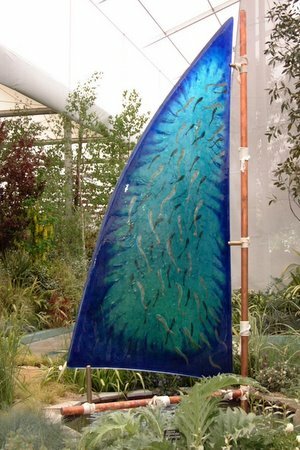 This monumental glass and metal sail standing over three metres in height was designed and created by Julia Webster, Creative Director of Glasszoo in partnership with Quist for the central Hillier Garden in the great pavillion at the Chelsea Flower Show in May 2008. This stunning sculpture represents a collaboration between Glasszoo and Quist, who requested a glass sail for Chelsea and designed the mast element. Two creative companies dedicated to fine design, craftmanship and developing the artistic potential of glass and metal for garden design. Julia has been exhibiting and selling decorative glass sails since 2003 after inspirational visits to Luxor on the Nile and Lesbos in the Aegean Sea. The beautiful glass for this sculpture was created by Colin Webster of Glasszoo for Quist. 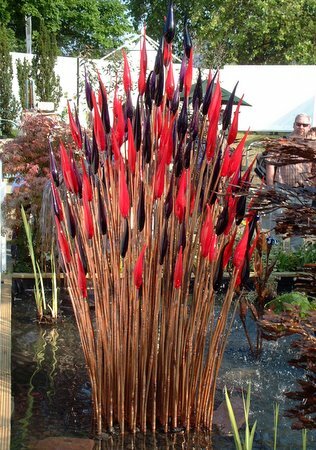 First shown at the 2008 Chelsea Flower Show it features exquisite, multiple handblown scarlet and purple bud forms that evoke the vibrant colours of wild plants.